Sisimpur is the Bangladeshi version of the popular children’s television series Sesame Street. Funded by USAID and airing in Bangladesh since 2005, the series is in its ninth season. One of the few initiatives that focuses on preschool education, Sisimpur is revolutionizing the field of education in Bangladesh. Nikita is a second grader in the lush green upazila of Srimongol. Her parents make a living from working in tea gardens. Srimongol is popularly known as the land of tea and even has a statue of a tea worker at its entrance. On this bright morning, Nikita is heading to school with an empty water bottle in her hand. The teacher had said she would perform a practical demonstration of something interesting for which the bottle would be needed. A classmate of hers walks past her carrying a candle. They soon find out these tools along with a nail, matches, soap, a rope, and a net bag will be used to build a simple hand washing device known as a tippy tap. With everything ready, the teacher takes the students outnear the school latrine to finally make the tippy tap. The kids are in awe. They begin to wash their hands using the soap. Nikita remembers the entire process thoroughly and goes back home to make one near her latrine. To her surprise, her younger brother soon starts using it. 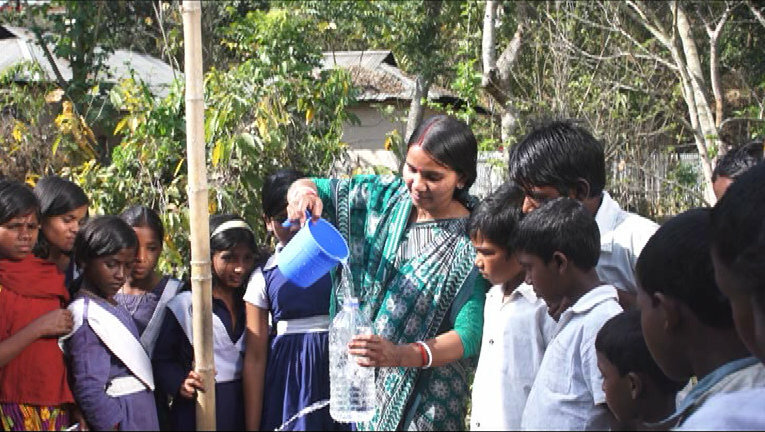 SPRING/Bangladesh was the first project in the country to promote the use of tippy taps. The popularity of these easy-to-make hand washing devices is rising at an exponential rate and they can now be seen near latrines in many places across the country. The children watching Sisimpur will pick up the habit of regularly washing hands with soap from a young age and pass it on to those in their circles who are still not doing so. In addition to the tippy tap segment, SPRING/Bangladesh has also contributed ideas for sketches related to nutrition. SPRING/Bangladesh’s collaboration with Sisimpur is another step in the project’s commitment to improve the health and nutrition of people across the country.